From Vietnam to Iceland, these are the most stunning, mysterious and amazing caves from around the world! 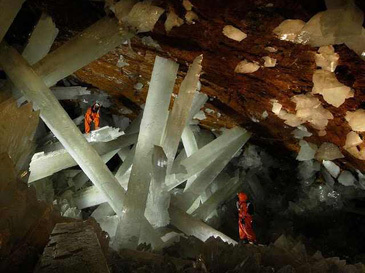 To find some of the largest crystals ever held by a human hand, look no further than the crystal cave. The mine is closed to the public due to its rather impressive depth and high temperatures. But plenty of photos were taken by explorers to show the world this amazing cavern. This is perhaps the largest known cave in the world, and is home to endless wonders we are still discovering today. It is so big, it has its own ecosystem and geological formations. Incredible ice caves like this one are formed in glaciers surrounding volcanos. Vents release heat and gases into the ice, creating openings, tunnels and caves from inside the iceberg. Vatnajokull Glacier is the largest glaciers in all of Europe. In glaciers so big, sometimes there is a melting of icewater, and thus caves are formed. But because glaciers are not passive, but constantly change, move and break - these are extremely dangerous to visit. The Batu Caves were used by the English, the Chinese and the indigenous Temuans. The bat guano in the caves used to be mined for farming, but now the cave is open to tourists and filled with fascinating statues. Another spectacular ice cave, this cave was born of the Mendenhall Glacier in Alaska. Melting icewater carved it, but taking into account the ever-moving nature of these glaciers, it may not be around forever. This area, the Algarve Region, is subject to many seaside rock formations due to the water erosion. This specific cave can only be reached by water. The Waitomo Glowworm cave in New Zealand is one of the only places where you can go to see a huge display of the glowworm. This tiny insect hangs glistening and glowing strands from the cave's celing and can be seen glowing all around, something that makes visiting these underground caves all the more fun. This cave is run through by the river Name Lang, in Northern Thailand. Visitors to this unique cave will find stunning stalactites and stalagmites, as well as huge amounts of Pacific swifts (type of bird) that spend their lives there. This cave has been retrofitted as a buddhist temple. The origins are murky at best, and we know very little about why and who chose it for this purpose. As you step into the Marble Caves of Patagona, you will witness incredible reflections from the turquoise waters, cast on the white marble ceiling. It took thousands of years for the persistent wind and water to carve this canyon, which made its walls smooth and fluid-looking. During monsoon season, this canyon can fill up quickly with rain water, and many an unwary travellers has lost his life to this sudden outpouring. The above story is provided from Baba Mail.